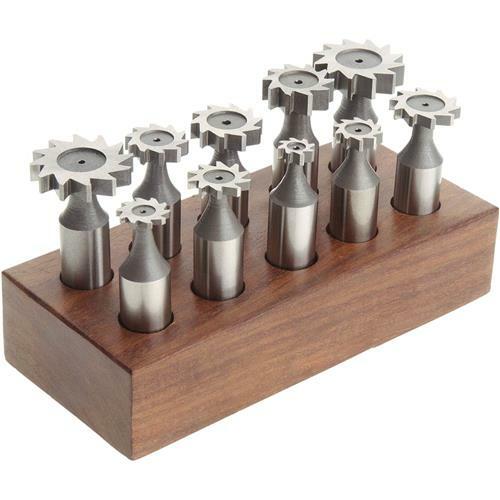 This Woodruff Key Cutter Set is made from high speed steel and features 1/2" straight shanks and straight tooth cutters. American Std. 403 3/8" x 1/8"
American Std. 204 1/2" x 1/16"
American Std. 404 1/2" x 1/8"
American Std. 305 5/8" x 3/32"
American Std. 505 5/8" x 5/32"
American Std. 406 3/4" x 1/8"
American Std. 606 3/4" x 3/16"
American Std. 806 3/4" x 1/4"
American Std. 608 1" x 3/16"
American Std. 808 1" x 1/4"
This product so far has performed well on cold rolled 1018 steel. I see no reason it will not work well on a variety of metals.